Anyone who knows me can tell you that I love makeup. I’ll get asked “are you going somewhere later?” because I look so done up, but the answer is usually no. I’m staying right here! I just love rocking bold lips and smoky eyes to watch Netflix or go to the grocery store. What can I say? That’s just me and colors are pretty! My everyday look tends to be inspired by the ’50s. I like strong eyeliner with a light flick on top, and a strong lip in a cool color. I love wearing lipstick since my glasses (while awesome), usually hide my eye makeup. Also, I’m someone who always accidentally messes up my makeup! So I’ve perfected my makeup routine to be so long lasting, I can’t even ruin it! In the morning, I wash my face with Whish! Revitalizing Cleansing Oil ($30). It may sound counterintuitive to put oil on your skin, but it’s been so amazing! And depending on your skin type, it can be super effective. I have sensitive, acne prone skin and every since I started using this product, my skin problems have really mellowed out. After that, I put on a light moisturizer and let it sit for a few minutes. 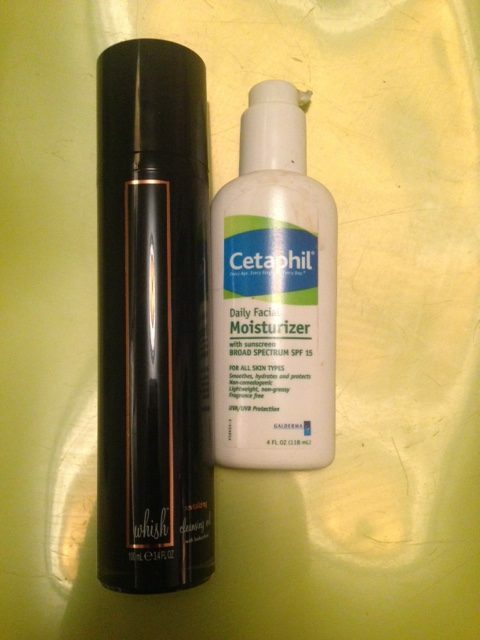 I really like Cetaphil’s Daily Moisturizer with SPF 15 ($15) since it’s gentle and light. Plus, you can find it at any drugstore, which is awesome. After that, it’s time for my secret weapon: Urban Decay’s Eyeshadow Primer Potion ($20)! I have hooded eyelids, which means when my eyes are open you can only see the tops of my lash line, and not the rest of my eyelid. It also means if I don’t put this super strong primer on, all my shadow and eyeliner will get rubbed off by the end of the day! This is what happens to my eye makeup without primer! It’s pricey at $20 for a little tube, but a little goes a long way, and it lasts a long time! 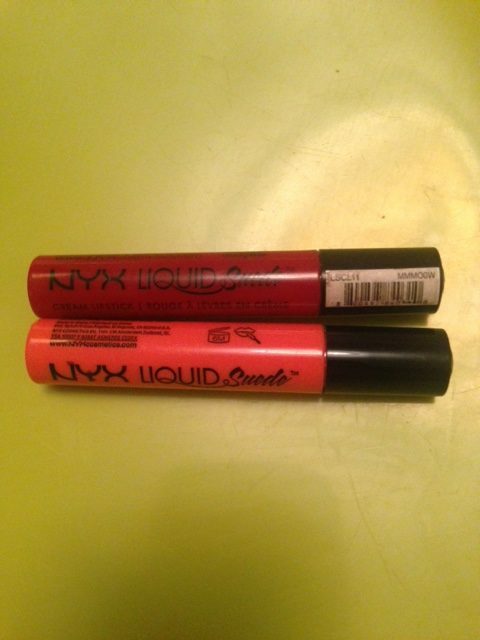 (I put on makeup almost every day and one tube lasts me a year)! While that’s drying on my lids, I apply BB cream and concealer. Since I have very sensitive skin, I only put on a little bit of each. Sometimes if I’m feeling fancy I’ll use a beauty blender ($20), but as long as I’m careful my fingers work just fine. 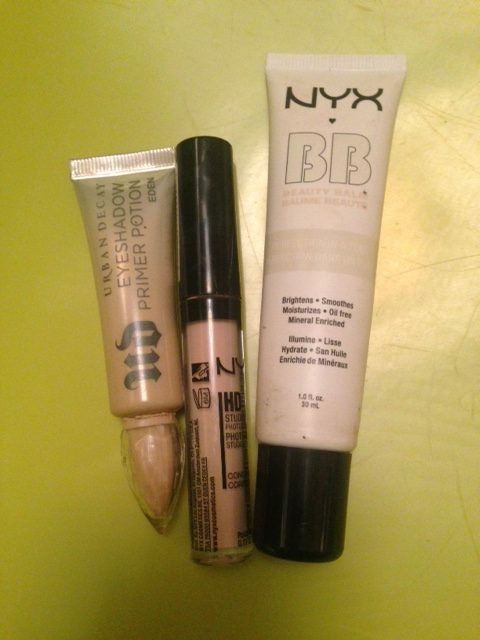 Lately I’ve been using NYX’s BB cream ($13) and it’s HD Studio concealer ($5), and they work like a dream! After this, I put on eyeshadow. I’m a big fan of eyeshadow palettes. Mostly because they’re cute and give you inspiration for eyeshadow combos. 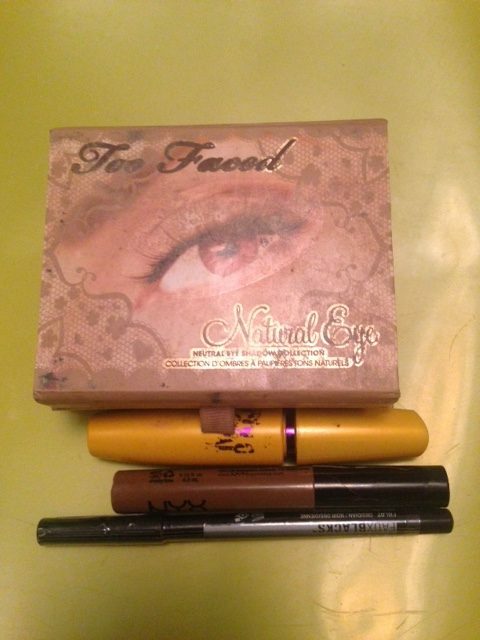 If you’re new to makeup and have some extra cash, I really recommend getting a Natural Eye Too Faced palette ($36). I really like the natural matte one, but they have a bunch of pretty ones in other color combos. The best part is that Too Faced palettes have little cards inside that give you tips on how to rock different eye shadow looks! They’re seriously my favorite. Lately I’ve been obsessed with a kind of quick smoky eye. How I do it is I take a light base color and put it all over my lid, and blend out to my brow bone. Next, I layer a darker color on top of the lid, and then use an even darker color on the edge of the eyelid and blend into the socket. Sometimes if I’m feeling more simple, I’ll just layer a single light neutral eyeshadow onto my lid and blend it well. After this, I apply eyeliner. I love a cat eye with liquid liner, but again, hooded eyes! Applying liquid liner is a debacle to say the least. I only put on liquid liner if I have ample time (so almost never). I actually have three eyeliners I love and swear by. The easiest to use is Eyeko Fat Liquid Liner ($18). Its applicator is a marker, so it’s so user-friendly, and perfect for liquid eyeliner virgins. I also love Urban Decay’s 24/7 Glide-On Pencils ($20). They look like and last as long as a liquid liner. They also come in a million cool colors! Lately, though, I’ve been using NYX’s Faux Black Eyeliners ($8). They have colors that are almost black but not quite. It gives a really unexpected pop of color that I’m totally into. My favorite right now is called “Black Hole” (which is a dark purple). I usually draw my liner right along the lash line and give it a tiny flick up on the corners of my eyes, cat eye style. The thickness of the line varies depending on how I’m feeling that day. Usually I don’t line my lower lash line, but sometimes I do when I’m feeling it. My favorite mascara in the whole entire world is Benefit’s “They’re Real!” Lengthening and Volumizing Mascara ($24). Sometimes I’ll fill in my eyebrows. 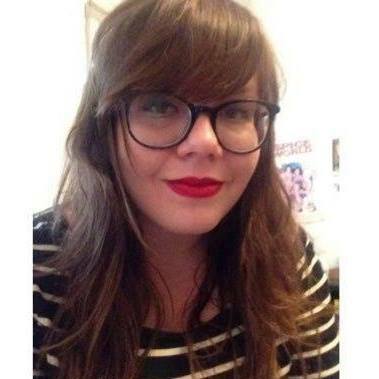 I have light eyebrows and wear my hair in bangs, so I mostly skip this step (shhh). When I do them I like to use Benefit’s Gimme Brow Volumizing Eyebrow Gel ($24), which is a tinted gel that you can brush on your eyebrows that darkens and shapes your brows. Lately I’ve been using NYX’s Tinted Brow Mascara ($7) in place of it and it honestly works just as well. Now. Lipstick! I love a bold lip, so I almost always pick a really cool, vibrant color. Lately, I’ve been obsessed with orange lipstick. I like it because it looks classic like a red, but with a bit of a twist. My current favorite is NYX Liquid Suede Cream Lipstick in “Foiled Again” ($8). If you want a classic red, I also have it in “Kitten Heels” which is really awesome, too. A lot of lipsticks will claim to be “kissable,” but this lipstick is makeout-able! Eat a burger-able! Sing karaoke all night with your friends-able! I’m not saying you have to wear it every day, but wear I suggest wearing it on days when you’re going to need to go all day without touchups, or just don’t want to worry about your lipstick smudging or fading. After all this I close my eyes and spray with NYX’s Long Lasting Matte Finish ($7.99) and let it dry. This stuff makes sure everything stays put all day and doesn’t rub off halfway through the day. This whole routine takes around 10-15 minutes. And there you have it, my favorite makeup look! Here I am modeling it a few weeks ago with some help from a bucket drummer and the L train! I would fill you in on my hair secrets, but I literally don’t do anything to my hair. It is straight to a fault, and I just wash it, brush it, and let it air dry. I wish I could tell you something more interesting but this is the truth! I’ve pretty much gotten my makeup to a place where it doesn’t wear off unless I want it to, so I don’t do much during the day. However, in the summer I always have a bottle of Neutrogena Ultra Sheer Dry Touch Sunscreen ($6.99). I burn really easily so this is essential to re-apply throughout the day. It isn’t greasy and is non-comedogenic so it won’t clog your pores, hooray! I carry Boscia blotting papers ($10) in my purse in case my nose or forehead gets shiny during the day. (This is a life saver during summer!) I also carry a compact mirror and whatever lipstick I’m wearing for the day with me in case I need to do a touch up. At the end of the day, I wash my face with the Whish! cleanser again. A couple times a week I’ll exfoliate (gently) with a DIY mixture of coconut oil and coffee grounds. 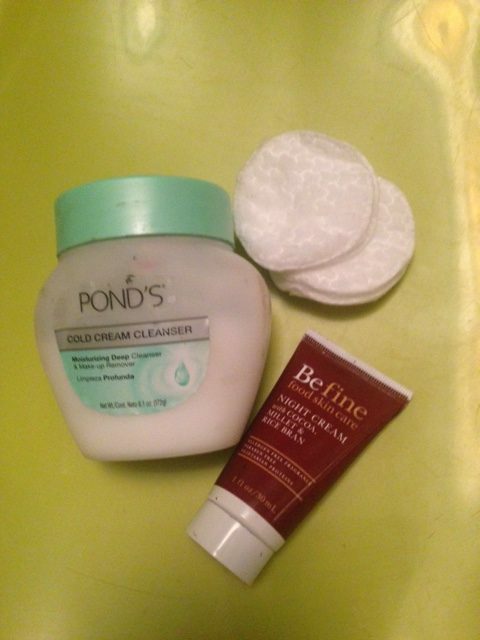 After that I take off all remaining makeup with Pond’s Cold Cream ($4.99). Pond’s is kind of a throwback. It was really popular in the ’50s (there was even a Mad Men episode around it)! However, it was popular for a reason. This stuff is gentle, it smells amazing, and it will take even the most stubborn makeup right off. Put it wherever you have leftover makeup and wipe it off with a cotton ball or round. After all this, moisturize! Preferably with something heavier than Cetaphil. Lately I like BeFine’s foodskincare Night Cream ($14.99) with cocoa, millet, and rice bran, but I change it up all time time. Then put on a good lip balm like Burt’s Bees ($3.30), and you’re all set! 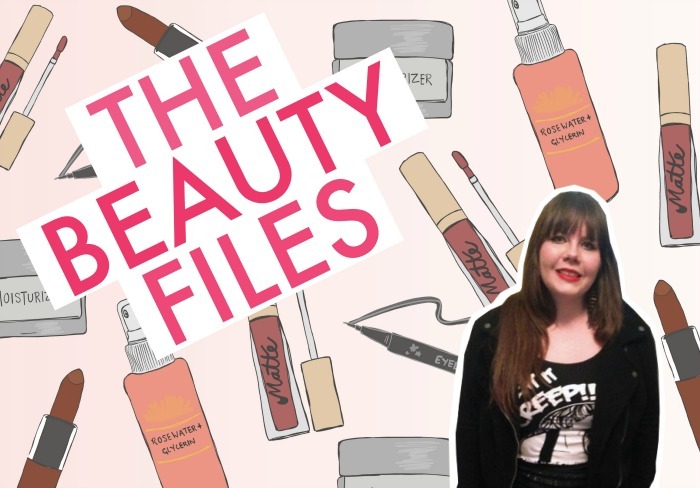 Indulge in beauty-themed voyeurism by reading all of our past Beauty Files here!